Loyalty programs — the practice of giving a token gift of some kind back to consumers in exchange for their business — date back to the Industrial Revolution in the late 1800s. As far as boomers are concerned, the most ubiquitous programs from our youth involved trading stamps. There were several different trading stamp companies operating in various states, with some states restricting and regulating their use to the point of keeping them out altogether. Merchants would buy the stamps directly from the companies, then give them to consumers as a bonus for their purchases. Often the stamp-to-purchase price ratio was one stamp for every 10 cents of purchase, with “bonus days” that could double the number of stamps given during periods of high local competition or marketing pushes. Stamps came in different denominations to allow for larger and smaller purchases. The stamps were perforated and the backs contained glue, like postage stamps, to allow consumers to moisten and paste them into pre-printed, 24-page books. Books were supplied free by the merchants. The heyday of the trading stamp era was the 1960s. Gas stations and supermarkets were the biggest purveyors of the stamps, though some other retail businesses occasionally participated. In Mister Boomer’s neighborhood, three trading stamp companies were operating: S & H Green Stamps, Top Value Trading Stamps and Gold Bell Gift Stamps. Since Mr. B’s dad did the grocery shopping and gassing up of the family car, he would bring home the stamps. The Boomer kids would lick the backs and, like cats that had tasted something unpleasant, made sour faces and repeatedly stuck out their tongues in an effort to rid their mouths of the flavor. Before the glue could dry on the paper stamps, they would paste them on the book pages, being careful not to mix up the various denominations and stamps from the different companies. After a period of trial and error, the Boomer kids learned to use a moistened sponge instead of their tongues to wet the stamp backs. S & H Green Stamps looked the most like postage stamps. A light green background had money-like swirls in a darker green that surrounded the red “S & H” in the center. The Top Value company used a plaid elephant as its logo. The animal’s Scottish cap and plaid body was a symbol of “thrifty,” which was a Scottish stereotype of the era. The stamps were printed with red banners above and below the Top Value name, which was also in red. Gold Bell stamps had a golden-yellow-orange background with a red bell in the center. The design, with its radiating rays from the top and bottom of the bell, looked more like a remnant of the 1930s or 40s. The key to getting a “free gift” was the redemption center, run by the stamp companies. These were stores in their own right, but instead of purchasing merchandise with cash, the consumer used trading stamps. Completed stamp books were exchanged for merchandise that ran the gamut from housewares to small appliances; lighting and home furnishings to bicycles and toys; and more. Each piece of merchandise required a certain amount of redeemed stamps, in the form of complete or partial books. A shopper could pick up a catalog in the store to take home that would show the available merchandise, along with the redemption requirements for each. This resulted in people “saving up” their stamps for a particular goal. Mister Boomer’s mom would walk, kids in tow, to the redemption centers. They were all clustered within a few blocks of each other in the city’s “downtown” area. There she’d shop for smaller items to carry back, or scope out larger ones that would require a family excursion on a Saturday to bring home the treasure. While the S & H and Top Value storefronts were rather non-descript, the Gold Bell Gift Stamp redemption center had a massive neon sign running the entire length of its storefront. Inside a series of concentric, rounded-corner rectangles were tall, san-serif letters spelling out “Gold Bell.” Just to the left of the name was an “animated” neon bell. When the sign was lit, it glowed a magenta-red. The bell would appear to “ring” left to right and right to left, an illusion created by neon tubes switching on and off between three positions. A reasonable facsimile of some items obtained by Mister Boomer's mom. There sure were a lot of brown colors around in the days before avocado and gold entered the scene. Mister Boomer’s mom was in charge of which items were acquired. As a result, household gifts were the biggest category of obtained items. 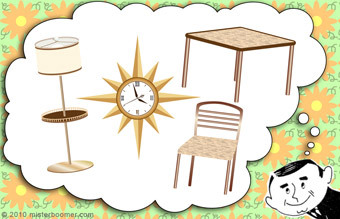 Mr. B can recall the family taking home a card table and set of four chairs, a standing lamp, TV trays and that symbol of 60s suburbia, a starburst clock. Naturally, it was hung against a paneled wall in the living room, where it remained for at least a decade. The card table and chairs, often employed on holidays where it became the kids’ table for meals, is still in use. It’s unclear if the giving of trading stamps ever swayed a single where-to-shop decision in Mister Boomer’s family. As is the case with most middle class families, they were more concerned with savings than store loyalty. As such, trading stamps were, indeed, a bonus. Well, boomers, can you recall an item your family obtained through redeeming trading stamps? Was the item for personal or home use, or to give as a gift to someone else? Remember when companies wanted your business enough to compete for it by offering free gifts? Many types of businesses used this marketing technique to gain new customers and keep current ones. Competition was fierce. Was there a broader business base when we were in our formative years? Or was it the expansion to the suburbs that produced the proliferation of entrepreneurial profiteers? In Mister Boomer’s case, that’s hard to say. In the pre-interstate freeway system days, Mister B’s neighborhood ran along the main truck route through his portion of the state. While that certainly would draw specific businesses to the area, like gas stations, others that cropped up were truly intended to service a local rather than transient population. Free gifts, clearly, were intended for a neighborhood clientele. They were looking for customers for life. Banks were probably among the most consistent givers of free gifts. The usual pitch, advertised in ads in local newspapers, was to offer a free toaster, blender, the occasional piggy bank (complete with bank logo) or $25 Savings Bond to open a new savings or checking account. It would seem, though, that timing was everything. Mr. B’s family didn’t seem to be able to cash in on this particular gift bonanza. Once the Boomer family children reached age 10 or 11, the parents walked them down to the closest bank, which is where they banked, and opened their first savings accounts. There never seemed to be any promotional giveaways in effect when the time came to start an account. There were regional banks around, but most were decidedly local in nature, with no more than a few branches in adjacent suburbs. Banks all over the country still employ this method of attracting new customers, so it looks like we boomers have learned to like free stuff from our parents. A quick check on the Internet has dug up offers for $50 to be placed into your new account, iPods, Flip cameras, cordless drills, step stools, gift cards, art prints, and even one that offered a free HDTV with an initial deposit of $20,000. Gas stations may be the one most of us recall as a great place for functional freebies. Before the oil embargo of the 1970s, gas stations were on almost every other corner. This caused a healthy competition that kept prices extremely low — in fact, most of us can recall paying twenty-five cents or less a gallon. There wasn’t going to be much more room for them to discount the gas, so starting in the 1950s they turned to giveaways to bring in new customers and keep regular customers loyal to their brand. They offered small toys, trinkets like keychains, maps, drinking glasses and logo-based specialty products. Of course, most of us recall the drinking glasses. At the rate of one glass per fill-up, your genuine Libby (or Anchor Hocking) set could be complete in a matter of a couple of months. Mister Boomer recalls Mobil and Shell giving away glassware in his neighborhood. There were Standard Oil, Cities Service, Sinclair, Mobil, Shell and Union Oil stations within ten blocks of the Mister Boomer household. Mr. B’s family preferred the “free” Welch’s jelly glasses to gas station glasses. Due to Mr. B’s sister’s addiction to peanut butter and jelly sandwiches, the glasses collection grew weekly. They were hearty glasses and seldom broke, so the excess was relegated to basement storage, only to be sold at bargain prices in a yard sale. Union Oil gave an orange ball with their blue logo on it in the late sixties or early seventies. The ball had a hole in the bottom to enable it to slip over your radio antennae. When your car was in a lot at an amusement park or shopping center, yours would stick out with this simple “car finder.” Unfortunately, yours blended with the hundreds of others who capped their antennae with the same ball. Sinclair Oil had a dinosaur in its logo. This gave them the opportunity to give away dinosaur-themed gifts, like coloring books and trinkets with the green dinosaur on them. There was a Sinclair station on the corner of Mr. B’s block. One day his father filled up at the station and gave the gift to Mr. B. It was soap in the shape of a green dinosaur, housed in a box about the size of animal crackers. Mister Boomer treated the soap as if it were a plastic model to play with, until his siblings didn’t approve of his outside-the-box thinking. They threatened to steal it away unless it was given its soapy utilitarian function. Jealousy had reared its ugly head over a free gas station gift, but Mr. B brought the “toy” into the tub after that. Local as well as national supermarkets hopped on the free gift bandwagon, too. Mr. B remembers his parents clipping the newspaper ad coupon for a free pound of Eight O’Clock coffee at the A&P. Mr. B’s father generally did the shopping with the kids — he would grab the red bag of coffee and spill it into the in-store grinder. He’d turn the dial to “Percolator” and let it rip. Imagine that. A free pound of coffee may be the reason Mister Boomer enjoys the aroma — but not the taste — of coffee to this day. There were many other free gifts for all of the area’s supermarkets, though they almost always required a coupon that ran with the weekly newspaper ad. Get a free 32 oz. bottle of a local brand of soda pop with an additional purchase. (Remember when soda pop was sold by the ounce instead of liter?) Get a pound of ground beef with the additional purchase of other fresh meat. Buy one of something, get another free. Every week something else would be available to lure customers into choosing one store over another. While not exactly free, but certainly in the subsidized gift category, were the bonus items at supermarkets that could be purchased for a reduced fee. The biggest promotions among these in Mr. B’s neighborhood were Corning Ware sets, china and dinner ware sets, and complete Funk & Wagnell’s encyclopedia sets, doled out one volume at a time. Each week the Mister Boomer family would pick up one of these items. The entire “good” china set that Mr. B’s mom owned (used only on holidays) came from these supermarket promotions. And the Funk & Wagnell’s encyclopedias were used umpteen times to complete school reports, saving the need for a trip to the local library. Other businesses got in the free gift action, too. A local pizzeria passed out flyers evry week, offering a small pizza free with the purchase of a large. A newspaper ad for a local menswear store offered a free shirt and tie with the purchase of a men’s suit. Many boomers recall these times with great nostalgia, lamenting the fact that today’s youth doesn’t seem to appreciate the true value of a dollar. Is that the case? Or is it that by percentage, the things we need day to day are now so much more expensive in relation to earned income? Or is it that our boomer parents, part of the burgeoning middle class, got a few breaks along the way in the form of something for nothing? What is the best free gift you remember from your early boomer days? Next week, in part 2 of this series, we’ll discuss the tremendous impact trading stamps had on boomer families.